We awoke to grey skies, rain and thunder on our first morning in Dover. 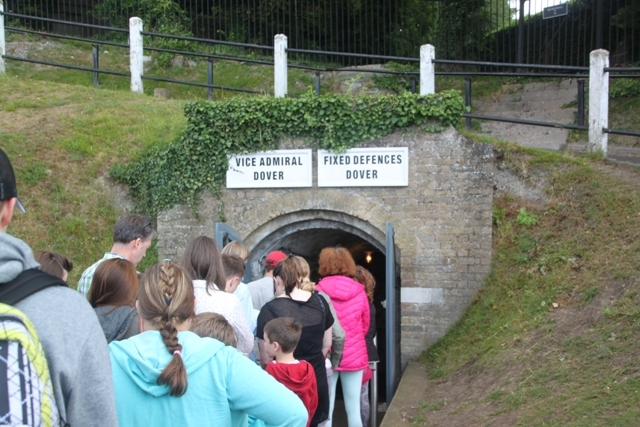 No matter, we were going deep within the rocks of the famous white cliffs in the tunnels below Dover Castle – a bit of adverse weather would make no difference down there. Just minutes from the town – you can see the sprawling hilltop castle from below, the car-park was almost full when we arrived at 10.00 am. An English Heritage site meant free entrance for us as members, we sorted our tickets and headed straight to the Secret Wartime Tunnels. These are the biggest draw of the castle, whatever the weather it is a good idea to visit them first. We found a long queue at the entrance but only waited fifteen minutes to go inside. These chalk hewn passageways were first excavated during the Napoleonic Wars and then expanded to form a command post and hospital in World War II. The fifty minute tour runs every twenty minutes, visitors enjoy staggered entrance to the tunnels to ensure everyone gets the full benefit of the experience. Inside they tell the story of Operation Dynamo – one of Britain’s most famous wartime operations. Directed from this very place in 1940, we heard how hundreds of thousands of men were evacuated from the beaches of Dunkirk. We passed through a whole series of rooms, the actual army headquarters and furnished as they were at the time, different parts of the story were told in different rooms. Powerful and vivid they used a mixture of original news reels, some recordings and dramatic special effects here and there. The climax in the very last room was incredible. Sights and sounds of the mission were projected onto the walls of the tunnels, full of drama and tension it was so well done – spine tingling stuff. When we came out we queued straightaway for the Underground Hospital Tour, a different set of tunnels and a different story. This is a shorter experience with more people on the tour (about 30) and it lasted around twenty minutes. The hospital was built in 1941/42 as a medical dressing station for injured troops and is also housed in the tunnels in the white cliffs. Again we experienced the sights, sounds and even smells of the hospital and the operating theatre – not always pleasant but definitely gripping. You walk while the story of an injured pilot fighting for his life is played overhead. Very vivid and dramatic, Son was a bit freaked out in parts but wouldn’t have missed the experience. We walked through the kitchens, dormitories, hospital and finally the operating theatre as the story was told. Lots to look at, smells of the time, flickering lights and air raid sirens sounding sporadically – it was very intense and felt as if you had stepped right back in time to a grim and frightening place. Apparently many people who did work in this hospital at that time went on to suffer severe depression – not hard at all to see why. Tour complete we found ourselves emerging above ground one level higher than where we started. The experience was moving and memorable but I was relieved to be back in the open again after all the tension and harrowing stories we had heard. The Admiralty Lookout was fascinating – the actual place where officers kept watch over the Channel. More historical artefacts to look at as well as great views. 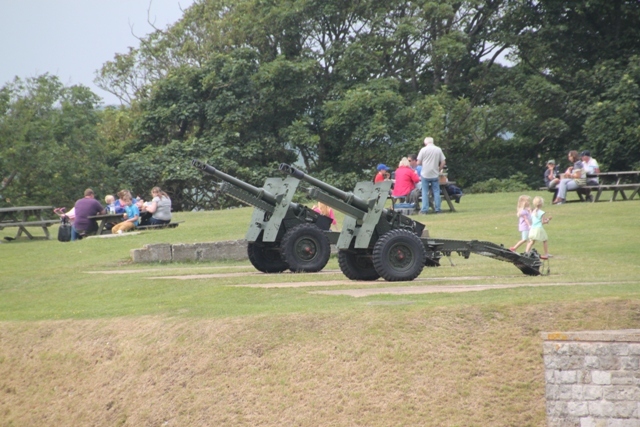 Plenty of wide open space as well – Son was pleased about that – battlements, military items to check out but more importantly stacks of room to run, climb and let off steam. The perfect antidote to an interesting but sobering time in those tunnels. We were there too. That was breathtaking but also nightmarish. History yelled from the walls. Exactly true Erika – nightmare is just the word to describe it. Interesting to learn about but we were so glad to get back above ground again. 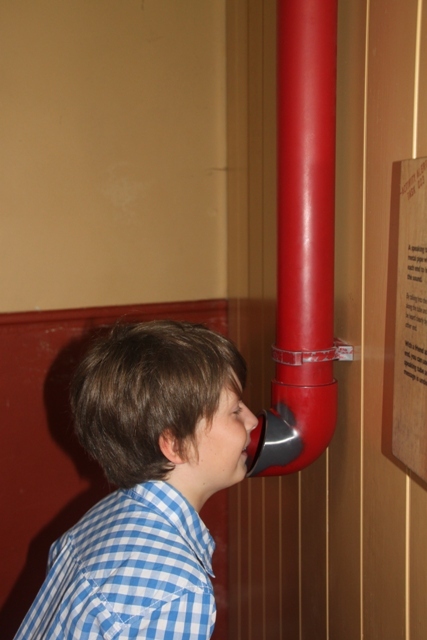 Did you visit the rest of the castle – that was a lot more of a fun experience!! 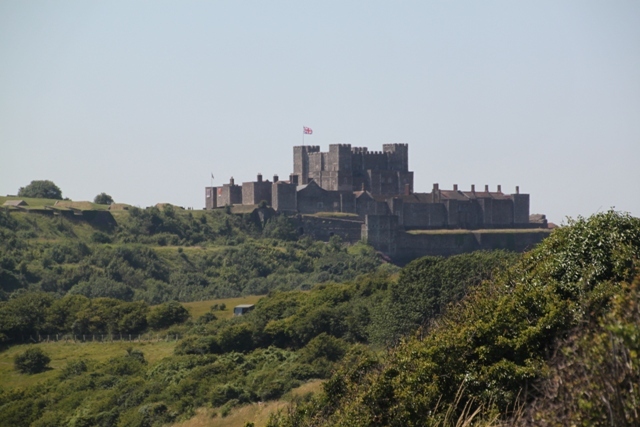 Thank you for sharing your experience at Dover castle. This place brings back a lot of war memories. It was fascinating for us to learn about the castle and its role in the war – some of it a bit harrowing but interesting and well worth seeing for sure. I never knew these tunnels existed. There are so many fascinating places to explore. Sounds like this was quite an experience. Thanks for sharing. These are incredible – you see no evidence of them from above but they run for miles inside the cliffs. It was an incredible place to visit. I visited the tunnels back in the 90s. It was a pretty impressive experience then, but it sounds like they are really amped it up since! 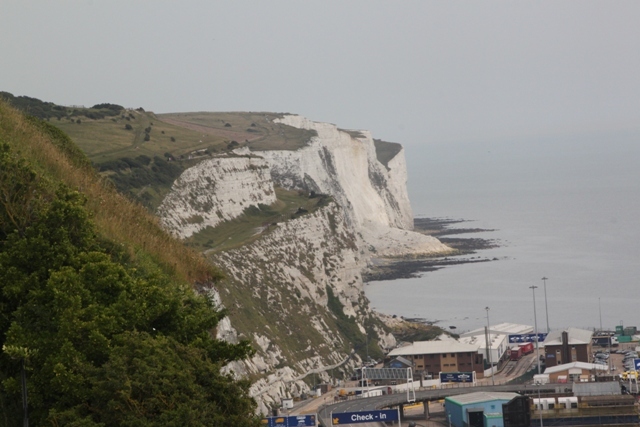 Love seeing photos of the white cliffs. 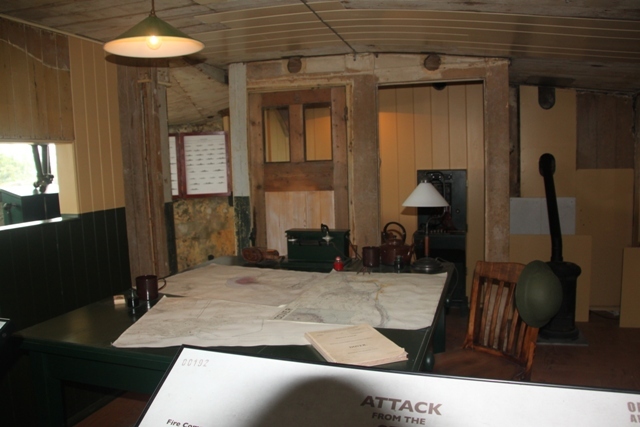 I think it was 5 or 6 years ago when the Operation Dynamo exhibition first started, since then they’ve also refurbished and recreated the keep which is impressive too – the whole place is incredible. Incredible! Didn’t know about these tunnels before this. Another item to add to our list of places to visit in the UK. They are amazing – so much history and the WWII story was told so effectively and so well. There are other parts of the castle to explore too – we found almost too much for one day. Thanks for the tip, will take note of that too. Cheers! Hey, a place I’ve been to as well! Years ago though, so this was nostalgic! Hope you enjoyed it as much as us!! We spent such a fun day there exploring. Your pictures capture the spirit of this historical coast! Last time I was there was over 20 years ago. Nice memories. Thank you Andrew for commenting – the history and landscape were fascinating and intriguing. We loved our more recent visit!! The hospital tour sounds really unique and interesting (probably also a bit depressing though). And a very scenic location for a castle! Both tours were so interesting and taking place in the tunnels made you feel as if you’d stepped right back in time. Full of atmosphere and not always loads of fun but definitely well worth doing. This must have been a fascinating visit. I’ll have to put this on my list. Thank you. This is one of the most intriguing and fascinating castles I’ve ever visited George – the tunnels are incredible and to think all that history played out down there during the war was spellbinding, definitely worth a visit. It seems like a popular place !! I would love to visit the tunnels. 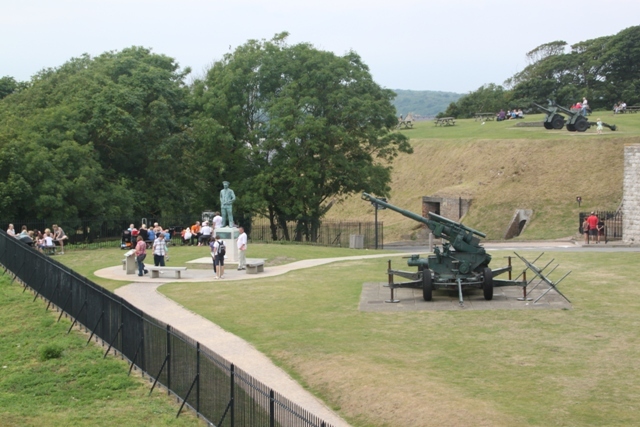 We have some in Namur (citadelle) as well, it’s quite impressive to be down there. They’re fascinating and the story is very well told. Good to know about the Namur tunnels too, we like that kind of thing and didn’t know about them already. Now something else to go on the list…. It was one of the most fortified constructions in Europe until large parts of the Citadel were demolished by Napoleon 🙂 The tunnels are really impressive. They had air-con, anti-gas systems and armored doors. Just googled it – looks amazing, how did I never hear of that before? Shame too as we went to Belgium after Dover but stayed in Brussels/Bruges and around the coast. Still an excuse to go back to Belgium is never a bad thing as far as I’m concerned and this is definitely a good one. It was well worth the squeamish bit Melissa – so interesting and really well done. It was a great day out for all of us. It was such a fascinating morning Rosemary, they have spent a lot of time and money getting this all up and running but it is well worth it. Just being in the tunnels would be amazing, but the way the stories are told and played out is so gripping and memorable. I’m sure you would love them – particularly with the Dunkirk family connection. Hope your weekend is good – we’ve had a lovely, sunny warm week but back to rain and cooler temperatures for the weekend. How typical is that!! I can imagine being in those underground tunnels and listening to these harrowing stories would freak me out too! But like you said, so interesting all at the same time. I love hearing about different parts of our history. The tunnels were fascinating anyway but the way they used old news reels and other effects to tell out the story was superb and made it so much more memorable. I didn’t even know there were tunnels…Incredible….Stunning cliffs! You would never guess looking at the cliffs what secrets lay below – fascinating to find out and explore, we loved it.